Chuck Berry introduces acts from the 1964 Teenage Awards Music International — including Bo Diddley, the Supremes, the Ronettes, James Brown, Marvin Gaye, Lesley Gore, and the Rolling Stones. 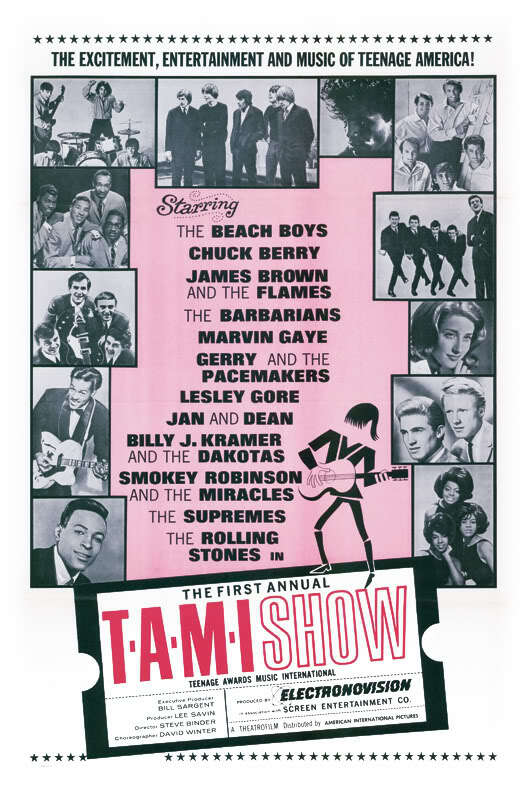 As Peary notes, this early concert film featuring hit American and British rock groups of the day is “silly, innocent fun”, with “some of the most cheerful acts you’ve ever seen.” Cinematically, the film is fairly standard concert fare, and the frenzied on-stage dancers are embarrassingly bad; nonetheless, “as a record of the ’64 music scene, it’s priceless.” My favorite acts (though naturally everyone will have their own) include Bo Diddley performing “Hey, Bo Diddley”; Lesley Gore singing “You Don’t Own Me” (featuring the film’s most creative camerawork); a handsome young Marvin Gaye singing several ballads; James Brown sashaying across the stage on one foot; and, naturally, the Rolling Stones (I especially love the way the camera captures Mick Jagger’s happy exhaustion at the end of each song). Yes, simply as a musical time-capsule. a) As a concert film, it’s surprisingly disappointing – with a number of performers/groups not particularly in top form. It’s also, in a way, somewhat dull and uninspired in the way it’s put together. b) If you really want to experience any of these performers, hearing their recordings will suffice. c) One has to wonder why something like this would be recommended to the average film fanatic at all, as opposed to some other kind of music-concept film – like ‘Woodstock’, which, at least, can be seen not only as a concert film but, more importantly, as a documentary making a sociological statement. Hell, even ‘Monterey Pop’ is a better straight-up concert film. – You can play a kind of ‘Where’s Waldo?’ game with yourself, in trying to occasionally spot a very energetic Teri Garr. – To me (I suppose, as a gay guy), Lesley Gore does make her part of the film worth it. Gore came out as a lesbian a few years ago and apparently wasn’t aware of her orientation (?!) until she was in her 20s. One can’t help but wonder what was going through her mind when she was singing song after song about relationships with guys. Her live version here of ‘You Don’t Own Me’ is actually kind of scary and pointed. (And the lyrics are mind-boggling; why are the two people in this song even together?!) Perhaps Gore singing ‘Maybe I Know’ was the vocal highlight for me (even though I think I like all of the performers captured).